WILLARD — After winning their sixth sectional championship in a row last Friday against the Lucas Cubs (59-50), the Colonel Crawford Eagles headed to Willard High School on Tuesday night as the No. 2 seed to take on the No. 3 seeded Norwalk St.Paul Flyers. 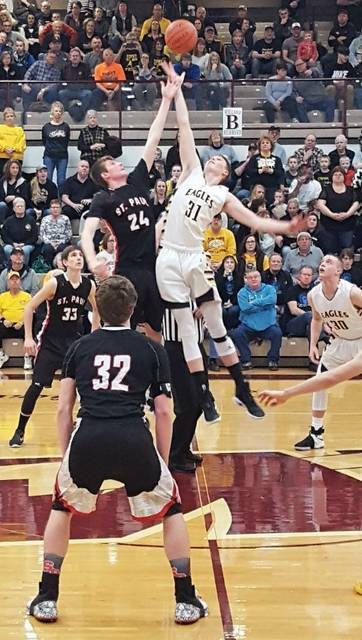 This Division IV district semi-final matchup would take 36 minutes to decide but in the end, it was the Eagles outlasting the Flyers by a final tally of 57-49. The Eagles would win the opening tip and took control of the game’s tempo from the first possession. Both teams exhibited poise and patience throughout the first quarter and played solid defense, as the first foul did not occur until St.Paul’s Dylan Furlong was whistled for the personal with 3:59 remaining in the first quarter. Big man Heath Starkey was utilized heavily in the first eight minutes of play as the Eagles took advantage of his height in the low post. After the first eight, Colonel Crawford would hold on to a 13-9 lead headed to the second quarter of action. The Eagles would tighten their defense further and not allow a clean look at the basket for the Flyers. St.Paul’s first points of the second quarter didn’t come until there was just 2:59 remaining in the half. A low scoring second of just 16 combined points took the teams into halftime with Crawford ahead, 20-18. Colonel Crawford would start out the second half with a quick turnover, leading to a bucket for the Flyers and a tied ballgame. The close play would continue to be a theme throughout this contest. As the third period came to a close, a desperation heave at the buzzer for the Flyers Jimmy Adelman drew a foul from Starkey. Adelman hit two of the three free-throws to close the quarter and put St.Paul within three points, 32-29. With the season in the balance, both teams continued to go back and forth in the final eight minutes of regulation. At the four-minute mark remaining in the fouth, the Eagles held on to a slim, 38-37 lead and both teams’ respective fans began to get loud. Colonel Crawford shot their first free-throws of the contest with just 3:02 remaining in regulation. Harley Shaum would hit them both in the high-pressure scenario. With just seconds left, Cam McCreary, point guard for the Eagles tried to make magic happen. With the game tied at 43, McCreary continuously tried to penetrate to draw the defense and create an open look. That open look came in the form of Gavin Feichtner, who would come up short on the buzzer-beating three point attempt. The Eagles would win the overtime tip-off and again control the tempo. Big shot after big shot lead to the overtime and would continue on in the extra frame. Starkey would foul out with 2:32 remaining and St.Paul senior center, Brandon McCall would pick up his fifth foul with 1:11 remaining. With small ball now in play and the score in favor of the Eagles, 50-49, Crawford would have to earn their victory at the free-throw stripe. The young Crawford squad proved they were up to the task and finished off the Flyers’ season. Colonel Crawford used a well-balanced attack to earn the gritty victory against the Flyers. Of the five players that scored for the Eagles, four finished in double figures and the fifth (Harley Shaum) finished with nine points. McCreary was the top scorer for the Eagles on the night. McCreary poured in 14 points to accomodate eight assists, three rebounds and four steals. Three of the McCreary assists came with the help of Reis Walker. Walker hit three-triples for the night, all off of Cam’s drive and dish mentality. Walker would finish with 11 points overall and three rebounds. Starkey wrapped the game with 13 points before fouling out. Heath also recorded six rebounds and five blocks against the Flyers. Jordan Fenner ended the game with 10 points, four of those points coming in clutch, free-throw shooting scenarios. Shaum had the aforementioned nine points, six rebounds, three assists, three blocks and a steal. Shaum made a living at the charity stripe against St.Paul, shooting 5/6. Eagles’ stat line: 15/26 (58%) from the inside, 5/16 (31%) from the outside, 20/42 (48%) overall; 12/15 (80%) from the free-throw line; 21 rebounds, 11 assists, eight blocks, seven steals and 12 turnovers. St.Paul had three players finish with double digit scoring on the evening as well. Dylan Furlong led the way with 15 points for the Flyers. Paul Pearce and Brandon McCall contributed 10 points apiece. Jimmy Adelman chipped in eight and Noah Winslow added six points to round out the St.Paul scoring for the contest. Flyers’ stat line: 17/37 (46%) from the interior, 3/13 (23%) from the perimeter, 20/50 (40%) overall; 6/15 (40%) from the free-throw line; 29 rebounds (15 offensive) and 15 turnovers. Now, it’s on to the district finals match-up against Mansfield St.Peter’s for the Eagles. St.Pete’s, the No. 1 seeded team in the bracket, defeated No. 4 South Central on Tuesday by a final of 79-41. Colonel Crawford and St. Pete’s face off for the Division IV Willard district title on Friday March 10 with tipoff at 7 pm. Tickets for the game will be on sale during school hours on Wednesday and Thursday and until 12 noon on Friday. Cost for the presale tickets are $6 for adults and $4 for students.